I seem to go for dinner either really early or really late. The last time I was tasked to do a review was to Taratata and I went at 6pm. This time, I went to Wolf at 8.30pm. Of all the restaurant reviews Andre has tasked me with, my experience at Wolf has been the only one that makes me want to rave. 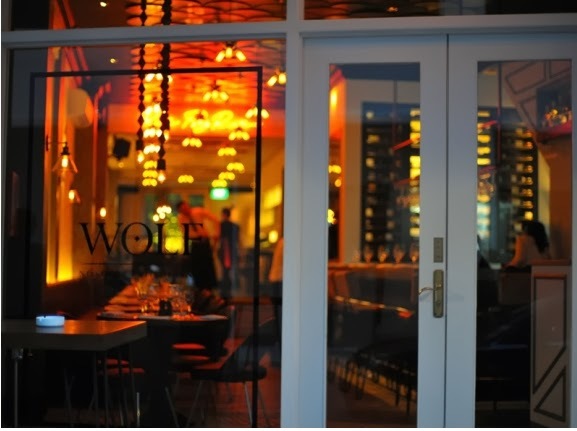 Wolf is a 'nose-to-tail' restaurant, this means that they cook and serve every part of the animal. The use of unusual cuts makes for bold, new, and unique flavours, and gives the chef a brilliant opportunity to display his/her culinary prowess. 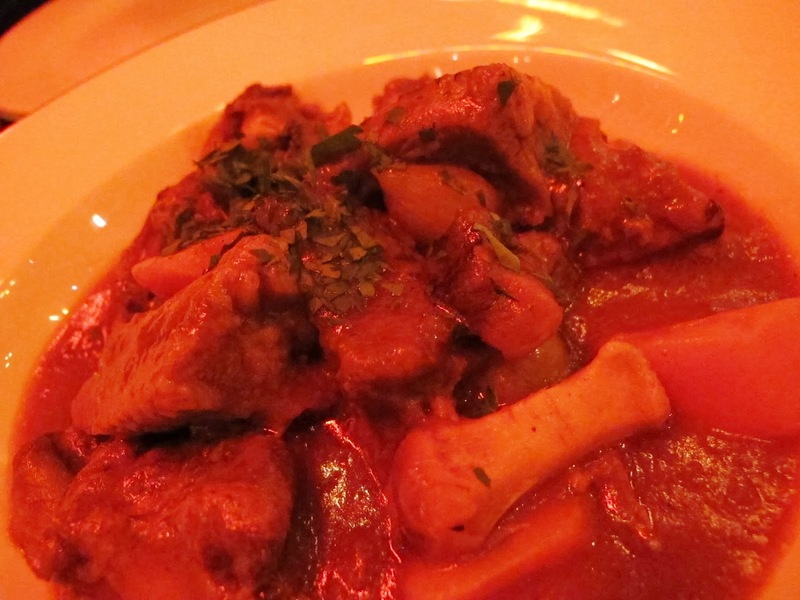 For starters, we asked for the Pig's Head & Trotter Brawn and Roasted Butternut Squash. 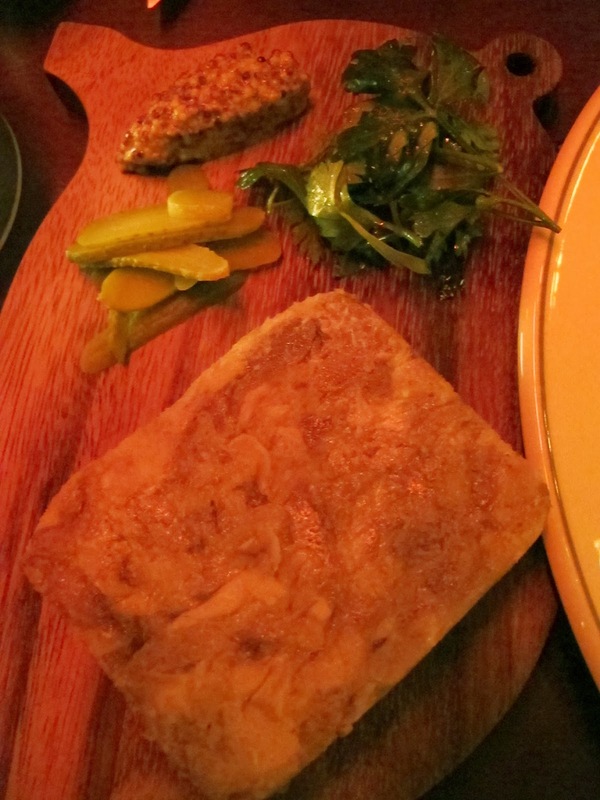 The Pig's Head Brawn is made with meat stripped from the pig's head and trotters and held together by gelatine. Though we sell something similar in Dempsey, Chef Alysia's rendition is unique and comes with herb salad, pickles, and a dollop of wholegrain mustard. Though its name may sound daunting for some (at least for me), it is awfully pleasant on the palate. It went well with the cilantro, the mustard, and even both at the same time! 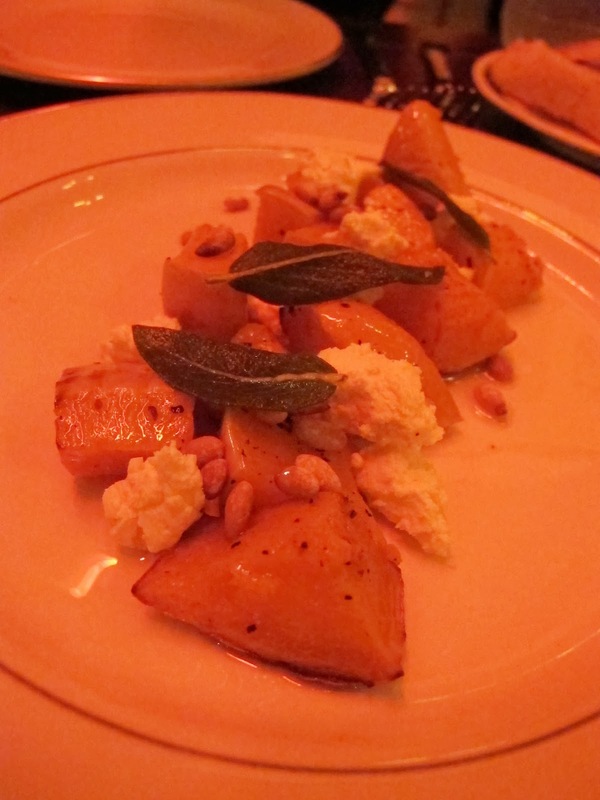 The cubes of roasted butternut squash came with home-made goat's milk ricotta, pine nuts, and sage, all drizzled with olive oil. The goat's milk cheese is rather mild so if you have always been wary of goat's milk cheese, this may be a good introduction. Give it a go! The sage leaves that garnish the butternut squash do more than the job of adding elegance to the dish; fried whole, the leaves are meant to be enjoyed. For mains, we had the Beef Lips & Oxtail Stew and Wood-smoked Kurobuta Pork Chop. As I had a conception in my mind of an average stew, much like the ones we do at home, I wasn't really looking forward to it. Since Colin my partner was keen, I went with it. I soon saw how wrong I had been to be skeptical. The stew came on a generous bed of mashed potatoes that was buttery, velvety, rich and authentic. No processed potato starch nonsense here! The wild mushrooms used in the stew were tasty and full of character. Colin was particularly impressed with it but he was sweet enough to restrain himself so that I could have my share. The beef lips had the texture of perfectly braised tendons but with some lean meat attached to it. Overall, the stew here is rounder in flavour than the ones elsewhere, be they home-made or restaurant versions. On to the Kurobuta Pork Chop. Kurobuta pork, also known as Berkshire, is known for its flavour, juiciness and tenderness. 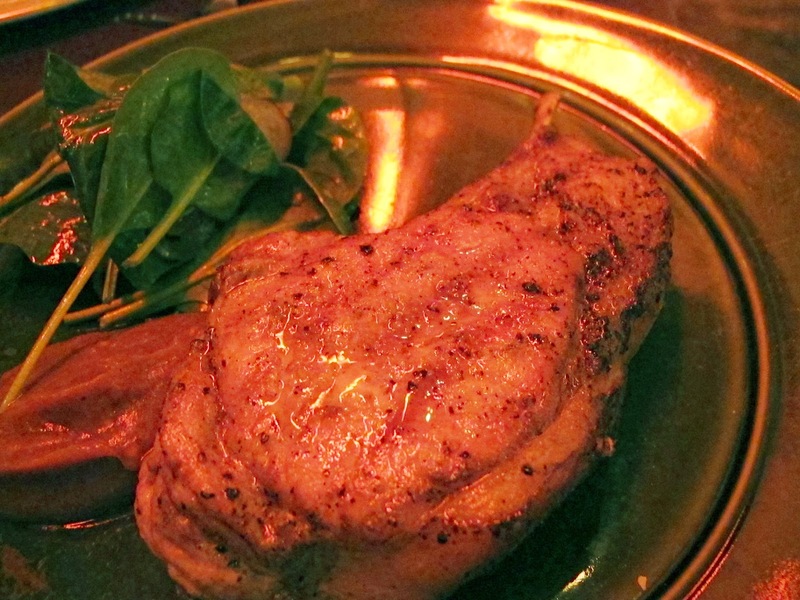 Indeed, the Kurobuta chop was done justice by the team at Wolf. You will be impressed with the nicely-seared glaze and distinct grill-marks. Take a piece of fat (without any meat). Pop it into your mouth. Close your eyes. Shut your ears to the laughter and chatter in the restaurant. Enjoy the melt-in-your-mouth magic. Pure bliss. The apple mustard and salad that came with the chop were nice accompaniments, especially the apple mustard, though the chop didn't require any of these. The desserts were not, in any way, unusual, except for the skill with which they had been executed. We had the Banoffee (banana + toffee = banoffee) Tart and the Pear Tarte Tatin. Though it says on the menu that ten minutes' waiting time is required for the Pear Tarte, we got ours pretty soon. 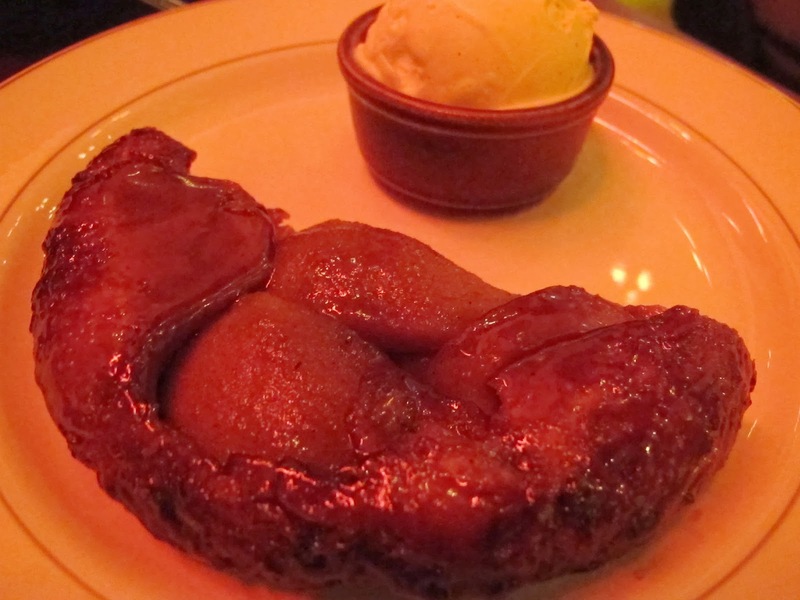 Served with rich, creamy vanilla bean ice cream, the Pear Tarte is basically chunks of skinned pear in pastry. Oven-baked and smeared with caramel, it is a warm, sweet, sticky piece of heaven here on your table. We were reduced to scraping bits of caramel and pastry stuck on the plate. This is my first time having Pear Tarte, thus I am not in a position to compare Wolf's offering to other versions of this dessert. I've seen recipes for it numerous times when browsing the web for new baking recipes, but it didn't catch my eye then. Now that Chef Alysia has blown me away with her Pear Tarte, I am making it my next baking project! The Banoffee Tart was lovely, a thick Digestive biscuit crust around caramelised banana and toffee, and covered in a mountain of whipped cream. This dessert from the UK is not as well-known here in Singapore, but if it were given more attention, it will easily win over the hearts of many. If you intend to have the same two desserts we had, please ask for the Banoffee Tart to be served first before the Pear Tart because the Pear Tarte will put the Banoffee Tart to shame. To be fair, the Banoffee Tart is really good by itself, it is only outshone by the Pear Tarte IN COMPARISON. Service at Wolf was perfect - attentive, approachable, knowledgeable yet not invasive. Our waiter was enthusiastic, knowledgeable, friendly, and well-spoken. He did a great job of making us feel welcome. Chef Alysia is fervent about serving obscure bits of an animal which are actually more tasty than they sound, and she has the culinary chutzpah to pull it off. If you are more adventurous than I am, check out the restaurant's Grilled Beef Hearts and Chicken Hearts & Liver salad. Judging by our experience, they will be stellar. One can feel the dedication, effort, and pride that go into the making of every dish. Every dish is a manifestation of Chef Alysia's attention to detail, passion, and artistry. And perhaps that's the reason why they call the restaurant by that name: you will Wolf down everything they put in front of you.